After moving house, Kate must now face the prospect of a strange new school, as well. She is startled to discover The Thing, a friend who is as new as she is but willing to accompany her into the new blank canvas of her life. Together they venture into this unknown world feeling ‘small and awkward and new’, yet slowly, as her courage grows, Kate begins to feel less and less alone, until one day she rediscovers her smile and becomes less reliant on The Thing by her side. This tale fills my soul with warmth and wonder. 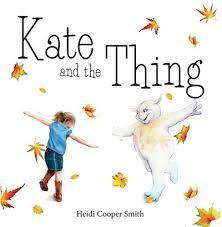 Smith’s melodious narrative and expressive illustrations tell Kate’s story of loneliness and self-doubt with a thoughtfulness that never wanes. It’s an absolute delight to read. When hope wilts, colours bloom. When uncertainty smoulders, kindness heals. Clever, original and completely relatable, The Thing will steal your heart then fill it with love. 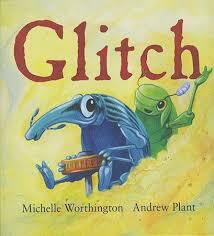 Ideal for 4 – 7-year-olds and anyone feeling a little unsure about themselves. Lilting musical prose and muted mellow watercolour illustrations promote hope and confidence to those fettered by feelings of hopelessness. 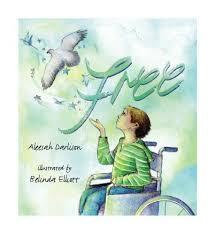 Free is a gentle story that will appeal to children in situations they find they have little control over, like being wheel chair bound. Sadness besets Flynn as he observes everyone around him having fun when he no longer can. Life in a wheelchair makes Flynn feel morose and secluded. He believes he no longer fits in and is reluctant to visit places like the park where he is constantly reminded of his confinement, until one day, he spies a magnificent bird. His dreams of flight and freedom reignite. He nurtures this new desire slowly and patiently until in time, Flynn is able to soar, just as he imagined, unbound by physical restraints. Free is a beguilingly written and illustrated story about overcoming adversities and transcending limitations that would appeal to children 5 – 8 years of age. 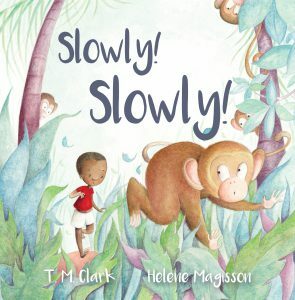 ‘Slowly, slowly catch the monkey’ is an expression of perseverance that I’ve used for years but to see it rendered in picture book format is a delight I never expected to embrace so joyfully. Slowly! Slowly! resonates with affectionate family values. Bongani is a small boy impatient to grow, learn, and be more than he is. His family temper his yearnings with humour and ancient fables to foster a sense of compassion and tenacity. Eventually, they succeed as does Bongani but not before he makes several attempts to catch his monkey. 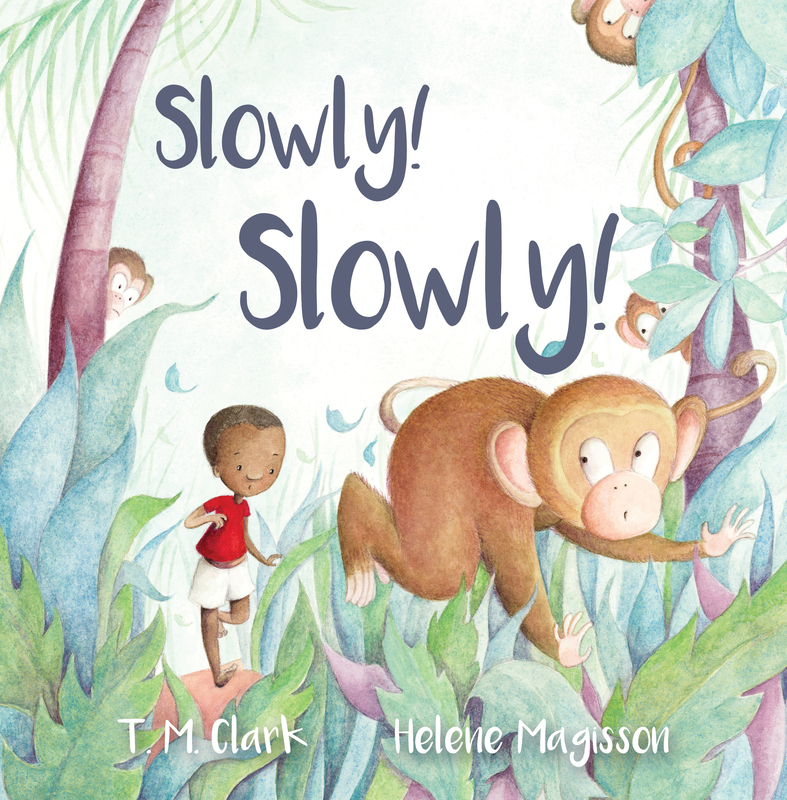 Clark’s prose is sincere and generous, sprinkled with enough repeating ideas and phraseology to tease little ones into turning the pages, while Magisson’s illustrations are a magnificent match to this inspired story. Visually powerful yet sculptured with heart, they possess a glowing quality that encourages you to explore every page for the treasures secreted within. Slowly! Slowly! is a successful blend of art and ancient fable that is a pure joy to experience. Share it with as many little monkeys as you can. Highly recommended. Loppy Lac and Curly Calmster are back in this third story in the Lac picture book series. It’s a welcome reunion that works miracles. When I was young, I was informed by an injudicious teacher that ‘as with every a bright might there is hardly a well-coordinated hand’. She meant well I’m sure, but her comment stuck with me as an adverse reflection on my handwriting ability. It’s a stigma I’ve been unable to shake – even if my handwriting is worse than chicken scrawl. Loppy faces similar pangs of imperfection as he attempts to complete his homework. It’s not until Curly calmly invites Loppy into the garden to observe the rampant and random growth of their beloved petunias that Loppy begins to understand that being perfect is not the measure of success but rather that trying your best is what unleashes the most perfect parts of you. We all too often focus on our shortcomings and mistakes instead of all the gazillions of seemingly small insignificant steps forward we make, allowing our imperfections to colour our perceptions of who we really are and our sum worth. This story flips that line of thought with an elegant understated use of colour and an uncomplicated meaningful narrative. Loppy and Curly are quirky individuals but ones kids around the globe can relate to because of their unique cultural ambiguity. The Lac series is one both adults and children will find valuable meaning in, each story a useful tool in overcoming emotional uncertainties and promoting emotional development. 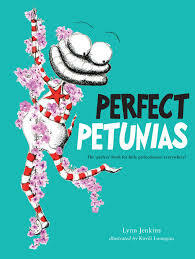 Highly recommended for primary aged readers and all of us out there with messy handwriting.